NuGet Package Manager - Easily install and update third-party libraries in Visual Studio. It currently has almost 8,000 packages. These include popular tools like jQuery, Json.NET, and NUnit. .NET Memory Profiler - This is the only extension that costs money on this list. Do you have a memory leak but not sure where it is? .NET Memory Profiler will help you find it. We've used it several times here at the office to help identify problems that had mystified us for weeks. Indent Guides - Are you always trying to figure out where a if statement ends? Indent Guides makes this easy by adding vertical lines for each indent level. 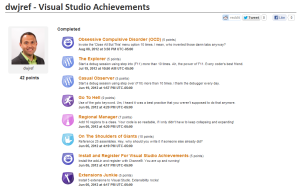 Visual Studio Achievements - Do you wish coding was more like a video game? 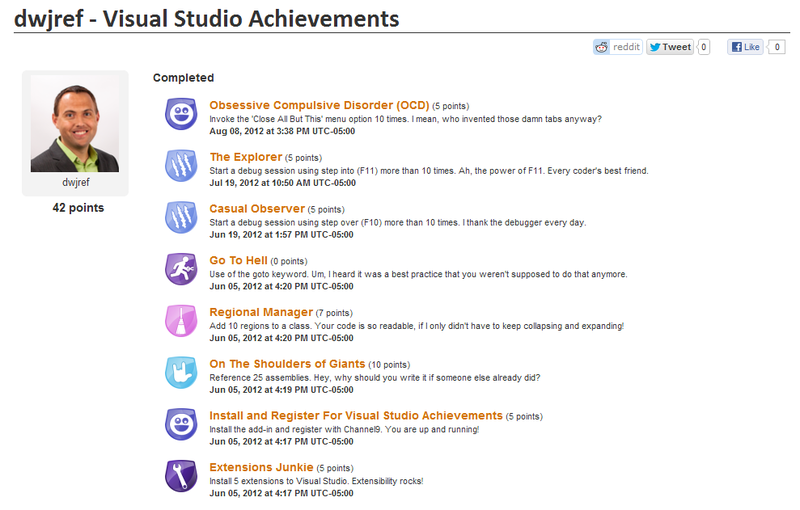 Achievements allow you to show off what you've done in Visual Studio. Reference 25 assemblies? Here's a badge. Add 10 regions, here's another one. Use the goto keyword just to say f' you computer science, here's your badge of shame. VisualHG, VisualSVN, or Git Source Control Provider - Depending on the source control you use, there's an extension to help manage your check ins. You are using source control, right? Visual Studio Color Theme Editor - Looking to easily customize the color palette of the IDE? Your eyes will thank you. What do you use to make your IDE better?